Let's experience running on of a molecular clock. 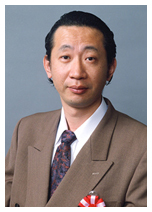 Okamura-lab starts in 1995 in Kobe, when Hitoshi Okamura becomes a professor of the Department of Anatomy II in Kobe University School of Medicine. Thereafter, main theme is the molecular mechanisms of mammalian circadian clock. Before describing the achievements of the laboratory, its prehistory is described briefly. In the Department of Anatomy II in Kyoto Prefetural University of Medicine (Professor Yasuhiko Ibata), Okamura encountered the dense cluster of vasoactive intestinal peptide (VIP) producing neurons symmetrically located just dorsal to the optic chiasma, which strongly impressed the dignity of the suprachiasmatic nucleus (SCN) at 1983. At that time, we analyze SCN by histochemical and electron microscopic techniques. During these days, we had a great effort to established two completely original methods which will be fruitful in later days. The first is the highly quantitative histochemistry (Brain Research, 1987; Mol Brain Res, 1995; J. Neuroscience, 1997), and the second is the in vitro organotypic slice culture technique for the study of the SCN (Neuroscience, 1994: collaboration with Professor Shin-ichi Inouye). At this time, we did not notice its powerfulness, but both two are flowered after 10 years when mPer genes are discovered. In France in Lyon and Gif-sur-Yvette supported by INSERM and CNRS (1987-1989)(Professors Michel Jouvet, Robert Naquet), we found that virtually all SCN neurons are GABAergic. Takahashi Y, Okamura H, Yanaihara N, Hamada S, Fujita S, Ibata Y: Vasoactive intestinal peptide immunoreactive neurons in the rat suprachiasmatic nucleus demonstrate diurnal variation. Brain Res., 497: 374-377, 1989. Okamura H, Abitbol M, Julien J.F, Dumas S, Berod A, Geffard M, Kitahama K, Bobillier P, Mallet J, Wiklund L: Neurons containing messenger RNA encoding glutamic acid decarboxylase (GAD) in rat hypothalamus demonstrated by in situ hybridization, with special enphasis on cell groups in medial preoptic area, anterior hypothalamic area and dorsomedial hypothalamic nucleus. Neuroscience, 39: 675-699, 1990. Tominaga K, Inouye S -I T, Okamura H: Organotypic slice culture of the rat suprachiasmatic nucleus: Sustenance of cellular architecture and circadian rhythm. Neuroscience, 59: 1025-1042, 1994. Okamura H, Kawakami F, Tamada Y, Geffard M, Nishiwaki T, Ibata Y, Inouye S-IT: Circadian change of VIP mRNA in the rat suprachiasmatic nucleus following p-chlorophenylalanine (PCPA) treatment in constant darkness. Mol. Brain Res., 29: 358-364, 1995. Ban Y, Shigeyoshi Y, Okamura H: Development of circadian VIP rhythm in the rat suprachiasmatic nucleus. J. Neurosci., 17, 3920-3931, 1997. Although the circadian clock genes were identified in 1984 in Drosophila, mammalian molecular mechanism of circadian rhythms was totally unknown even at 1995. For example, there were many groups believing the circadian rhythms being produced by the networks of neurons as sleep-wake cycles, since many molecular efforts during 13 years had failed to isolate the clock genes in mammals. In 1997, we discovered the human and mouse genes encoding PAS-domain (PAS, a dimerization domain present in Per, Amt and Sim)-containing polypeptides that are highly homologous to Drosophila period by the collaboration of Dr. Hajime Tei in Tokyo University (Nature, 1977). We named this gene as mPer1, and thereafter, we proceeded the molecular dissection solely in my laboratory, and isolated another two mammalian mPer genes (mPer2 and mPer3) and mammalian homology of timeless (mTim) (EMBO-J, 1998). Subsequently, we have found that mPer1 is light-inducible and acts as a “pendulum”, committing the phase-shift of the circadian clock by light (Cell, 1997). Collaborating with Professor Jay Dunlap (Dartmouth University), we found that mammalian clock is a day-type clock similar to Neurosopra, although Drosophila’s clock is night-type clock. Together with the discovery of Clock gene by Professor J. Takahashi, our studies contributed the establishment of the concept that the mammalian circadian rhythms are generated at the gene level. Shigeyoshi Y, Taguchi K, Yamamoto S, Takekida S, Yan L, Tei H, Moriya T, Shibata S, Loros JL, Dunlap JC, Okamura H: Light-induced resetting of a mammalian circadian clock is associated with rapid induction of the mPerl transcript. Cell 91, 1043-1053, 1997. Takumi T, Taguchi K, Miyake S, Sakakida Y, Takashima N, Matsubara C, Maebayashi Y, Okumura K, Takekida S, Yamamoto S, Yagita K, Yan L, Young ML, Okamura H: A light independent oscillatory gene mPer3 in mouse SCN and OVLT. EMBO J. 17: 4753-4759, 1998. Fig. 1 Clock genes and a model of the core feedback loop in the mammalian cells. Although we are interested in producing knockout mice of these mPer genes to characterize these genes, we have neither facilities to make these animals, nor financial support at that time. So, we were searching low cost but scientifically important works to prove that mPer genes really have the clock oscillating ability. It is noteworthy that the molecular studies suggest that mammals and Drosophila utilize similar components to generate circadian (~24 hour) rhythms. To prove that the mPer1 and mPer2 genes indeed have the capability to generate oscillations, we collaborated with Professor Amita Sehgal (University of Pennsylvania) the discoverer of Drosophila timeless, and investigated whether the introduction of mouse mPer1 and mPer2 genes into the arrhythmic per01 mutant of Drosophila caused functional recovery. Behavioral assays showed that both mPer1 and mPer2 constructs driven by Drosophila timeless promoter restored rhythms in per01 flies that are otherwise arrhythmic due to a lack of endogenous PERIOD protein. Thus, incorporation of mammalian mPer1 and mPer2 genes into Drosophila mutants demonstrates that both mPer1 and mPer2 can function as clock components. This study is unique, and indeed appreciated from some researchers, but the recovery rate of flies are at most 20%, thus cannot be published in leading journals at 1999 (Later we published the results at 2002 to Genes to Cells). Later mice homozygous for the targeted allele of mPer1 and/or mPer2 were reported by 3 groups (Drs. Lee, Reppert and Sassone-Corsi), showing the severely disrupted locomotor activity rhythms during extended exposure to constant darkness. Shigeyoshi Y, Meyer-Bernstein E, Yagita K, Weili F, Chen Y, Takumi T, Schotland P, Sehgal A, Okamura H: Restration of circadian behavioral rhythms in a period null Drosophila mutant (per01) by mammalian period homologues mPer1 and mPer2. Genes Cells, 7, 163-171, 2002. Fig. 2 Restoration of circadian rhythm in per01 flies after the introduction of mammalian mPer1 or mPer2 genes. A Actogram (left) and its period length analysis (right; period length is indicated in hours at the top of periodigrams) of transgenic flies (dtim-mPer1, dtim-mPer2) and controls (per01 and wild type, WT). Circadian time is indicated at the top of actograms, consecutive days at left of actograms. The significance line denotes a 0.05 level of significance. B Frequency distribution of activity periods in tim-mPer1- and tim-mPer2-containing transgenic flies. C Difference of the period length in mPer1- and mPer2- restored rhythms. Just after the discovery of mPer genes, the mammalian clock study goes Drosophila as a model. In this line, mTim, mmammalian counter part of Drosophila timeless, was soon be cloned. Soon, clock and bmal1 are established as positive transcription factors on mPer genes following the negative feedback theory of Drosophila clock machinery. However, the breakthrough comes from the unexpected field. Professor Gijsbertus van der Horst, a researcher of DNA repair in Netherlands, made the knockout mice of mammalian cryptochromes (Cry1, Cry2), and surprisingly found that these mice were completely arrhythmic in behavior (Nature, 1999). Just after they got this result, we began the collaboration whether master clock in the SCN are working or not. Okamura and lab members trip to Rotterdam for one week experience: fixed smples from these mice are successfully depicted. By the quantitative in situ hybridization methods, we found that the mPer gene oscillation was completely abolished in the central clock (SCN) (Science, 1999). At the same time, clock gene oscillation was abolished in peripheral tissues (liver) of Cry deficient mice. Then one question arises: does the peripheral clock oscillation influence the behavioral arrhythmicity? We performed the transplantation of wild-type SCN to arrhythmic Cry-deficient mice, and found that the behavioral arhhythmicity was recovered by the transplantation of wild-type SCN (Current Biology, 2003). This rhythm emergence strongly suggests the unnessessity of non-SCN peripheral clocks for formation of behavioral rhythms. This result claims the SCN as the synchronizer, but strongly supports the SCN as the rhythm generator at behavioral rhythms, although rhythms of peripheral clocks (endocrine, or enzyme etc) have not been addressed. abolished it. Okamura H, Miyake S, Sumi Y, Yamaguchi S, Yasui A, Muijtjens M, Hoeijmakers JHJ, van der Horst GTJ: Photic induction of mPer1 and mPer2 in Cry-deficient mice lacking a biological clock. Science 286, 2531-2534, 1999. Fig. 10 Double-plotted locomotor activity rhythms of SCN-grafted Cry1/Cry2 double knockout mice. Arrhythmic Cry1/Cry2 double knockout mice first lesioned SCN, then received brain transplantation operation of neonatal SCN. Two weeks after transplantation, activity bouts gradually consolidated to form a free-running rhythm with a shorter than 24 hour period. Since main components of core clock oscillation had been revealed, a number of laboratories began to clarify the molecular mechanisms of the mammalian clocks in 1998-2000. The cellular circadian oscillation in mammals to start with the transcription of two genes: mPer1 and mPer2. Expression of these genes is stimulated by heterodimers formed by the bHLH-PAS proteins CLOCK and BMAL1. We demonstrated that mPER proteins made in the cytoplasm, translocate into the nucleus (Genes Develop, 2000), and form a negative complex comprised of mCRY1, mCRY2, mPER1, mPER2, mPER3 and mTIM that suppresses the transcription triggered by CLOCK and BMAL1. Importance of posttranscriptional mechanisms including phosphorylation and degradation are suggested. We demonstrate that mPER1 and mPER2 proteins usually shuttle between the cytoplasm and the nucleus and are easily degraded by ubiquitination and the proteasome pathway (EMBO-J. 2002; MCB, 2005). Ubiquitination of mPER proteins is inhibited by the presence of mCRY proteins. Since mCRY protein can also be ubiquitinated when mPER proteins are absent, the mPER/mCRY dimer is stabilized against degradation, suppresses mPer1 and mPer2 transcription, and shuts off mPER synthesis. Since it is speculated that the transcription level of mPer genes is determined essentially by the concentration of mPER/mCRY dimer in the nucleus, re-starting mPer transcription depends on the export of the mPER proteins out of the nucleus by the CRM1/Exportin1 nuclear export machinery. The consequent decrease of mPER destabilizes mCRY, and the decrease of mCRY then allows mPer1 and mPer2 gene transcription to restart. Yagita K, Yamaguchi S, Tamanini F, van der Horst GTJ, Hoeijmakers JHJ, Yasui A, Loros JJ, Dunlap JC, Okamura H: Dimerization and nuclear entry of mPER proteins in mammalian cells. Genes Develop. 14:1353-1363, 2000. Yagita K, Tamanini F, Yasuda M, Hoeijimakers JHJ, van der Horst, GTJ, Okamura H: Nucleocytoplasmic shuttling and mCRY dependent inhibition of ubiquitination of the mPER2 clock protein. EMBO J. 21, 1301ー1314, 2002. Yamamoto Y, Yagita Y, Okamura H: Role of cyclic mPer2 expression in mammalian cellular clock. Mol. Cell Biol., 25, 1912-1921, 2005. Fig. 3 Phospholylation, degradation and nuclear translocation of mPER proteins. The existence of cellular clock was indicated by the demonstration of circadian expression of clock genes in fibroblast cell lines after the serum-shock revealed by Schibler’s group in Geneva. Are there any differences of autonomously rhythmic clock genes in these cells and those in the SCN? We addressed this question by using spontaneously immortalized mouse embryonic fibroblasts (MEFs) from wildtype and Cry1-/-Cry2-/- mice (Science, 2001). Both wildtype and Cry1-/-Cry2-/- cell lines showed clock properties similar to those found in the SCN of wildtype and Cry1-/-Cry2-/- mice, respectively. These included: (i) temporal expression profiles of all known clock genes, (ii) the phases of the various mRNA rhythms (i.e. antiphase oscillation of Bmal1 and mPer genes), (iii) the delay between maximum mRNA levels and appearance of nuclear mPER1 and mPER2 protein, (iv) the inability to produce oscillations in the absence of functional mCry genes, and (v) the control of period length by mCRY proteins. These results strongly support the conclusion that the components and oscillatory mechanism of central clocks (in the SCN) and of peripheral clocks are essentially identical. Yagita K, Tamanini F, van der Horst GTJ, Okamura H: Molecular mechanisms of the biological clock in cultured fibroblasts. Science 292, 278-292, 2001. Fig. 4 Endothelin-induced time-dependent gene expressions of mRNA (black dotted line) and proteins (red line) in mPer1 (A) and mPer2 (B) in mouse embryonic fibroblasts (MEF). Note 6-8 hours difference of mRNA and proteins in both mPer1 and mPer2. (C) (Left) Circadian expression of Per1, dbp and Bmal1 in wild type MEFs and mCry1-/-mCry2-/- MEFs. (Right) mCry1-/-MEF (square) and mCry2-/-MEFs (filled circle). An important question is how the time information generated by the cell clock oscillator is transmitted to the hundreds of clock controlled genes (ccg) that represent the output of the clock. Two routes are proposed: the first goes directly from the central loop of the mammalian clock to the ccgs through E-box (CACGTG). The second route is indirect, and regulates the antagonistic effects of PAR proteins (DBP, HLF, TEF) and E4BP4 on the D-box (Mol. Cell Biol., 2000; Genes Develop 2001). PAR proteins activate the transcription of target genes by binding to the specific sequence RTTAY GTAAY (R, purine; Y, pyrimidine) during the day, and E4BP4 suppresses transcription of these target genes in the night. E4BP4 and the PAR proteins may switch back and forth in turning target gene transcription on and off. Since many of genes contains D-box, it is speculated over 100 genes are circadianly regulated by D-Box. Yamaguchi S, Mitsui S, Yan L, Yagita K, Miyake S, Okamura H: Role of DBP in the circadian oscillatory mechanism. Mol. Cell. Biol. 20:4773-4781, 2000. Mitsui S, Yamaguchi S, Matsuo T, Ishida Y, Okamura H: Antagonistic role of E4BP4 and PAR proteins in the circadian oscillatory mechanism. Genes Develop. 15, 995-1006, 2001. Fig. 5 The core, accessory and output molecular mechanisms of the mammalian circadian clock. BMAL1/CLOCK heterodimer binds to E-box in clock oscillating genes and ccg, and accelerates their transcription. The core feedback loop provided by mPer1 and mPer2 is supplemented by an accessory PAR protein loop. DBP accelerates the mPer1 transcription, but E4BP4 maximally expressed in counter phase to PAR proteins suppresses mPer1 transcription. Next, we will show the examples how core clock regulates cellular functions by analyzing the association of circadian clock and cell cycle. Since the life span of each cell is limited, cell growth and mitosis are required to maintain organ or tissue function. There is substantial evidence that circadian rhythms affect the timing of cell divisions in vivo: day-night variations in both the mitotic index and DNA synthesis were found in oral mucosa, corneal epithelium, and bone marrow. These studies used histochemical techniques and normal physiological conditions, so the mitotic cells comprised only a few per cent of the cells examined. A suitable system with a high proportion of dividing cells is required in order to apply biochemical techniques to study the molecular links between regeneration and the circadian clock. We noticed that the liver provides a suitable organ since it is known to undergo vigorous regeneration after incomplete surgical removal. Although the cell cycle period overall is several months in unoperated animals, a 2/3 partial hepatectomy (PH) induces the large majority of the remaining, pre-existing hepatocytes to divide, and the regeneration speed is so rapid that liver mass is restored within 7days. Moreover, expression of mPer1 and mPer2 oscillates vigorously in liver, and the temporal profiles and the vigorousness of the expression of clock genes were not altered after PH. Thus, the mouse liver is very suitable for analyzing the molecular connection between the circadian clock and the cell cycle. We first compared the rate and timing of liver re-growth after PH in mice, when PH was performed in the morning at lights-on or in the afternoon (Science, 2003a). S-phase kinetics, represented by the incorporation of bromodeoxyuridine (BrdU), was similar in both morning-operated and afternoon-operated animals. However, there was an 8 hour delay in the M-phase (cells entering mitosis) when PH was performed at morning, as compared to afternoon. This indicated that the timing of the hepatectomy determines the timing of entry into M-phase for these regenerating cells. To determine the impact of circadian clocks on the cell cycle, clock-less arrhythmic Cry1-/-Cry2-/- mice were subjected to PH (Science, 1999). In these mice, mitosis was severely impaired, and liver regeneration was severely blunted. We performed DNA arrays and Northern blots to characterize the molecular differences in M-phase entry and found that cyclin B1 and cdc2 were positively correlated, and wee1, the gene for a kinase that inhibits mitosis by inactivating CDC2/cyclin B, was negatively correlated to M-phase. This is interesting since all these genes are cell cycle regulators governing G2 to M transition, and these expression profiles correlate well with M-phase progression. In the livers of normal mice, there were clear circadian rhythms of wee1 expression, with very low levels in the morning and high levels in the night. Levels of wee1 were always high in Cry-deficient mice, whereas levels were always low in Clock mutant mice (Clock/Clock). There are three E-boxes in the 5' UPR of wee1, which were, furthermore, activated by CLOCK/BMAL1 and suppressed by PER2, PER3, CRY1 and CRY2. These results suggest that wee1 transcription is regulated directly by the core feedback loop through its E-box elements. Changes in transcription of wee1 are reflected at the protein level, influence CDC2 activity levels, and are negatively correlated with the mitotic peak. WEE1 phosphorylates the cyclin-dependent kinase CDC2, a key regulator of G2 to M transition. In order to allow entry into mitosis, CDC2 has to be dephosphorylated by CDC25, a protein phosphatase, and it is the competition between the activities of WEE1 and CDC25 that determines the phosphorylation status of CDC2 (and hence the propensity of cells to enter mitosis). Only when WEE1 levels are low (normally in the morning) can CDC25 phosphatase successfully antagonize the action of WEE1. These findings, taken together, demonstrate that the circadian clock controls the G2 to S transition via the regulation of WEE1. Together with the report demonstrating a high incidence of lymphoma in mice lacking the mPer2, our present study sheds light on the association of circadian rhythms and cell division. Matsuo T, Yamaguchi S, Mitsui S, Emi A, Shimoda F, Okamura H: Control mechanism of the circadian clock for timing of cell division. Fig. 6 Control of cell cycle by cell clock. Schematic representation showing the link between the circadian clock and the cell cycle (upper). Role of CDC2, cyclin, WEE1 and CDC25 in making active MPF (M-phase promoting factor) is depicted at the bottom. Above studies revealed that cell clocks govern many of the cellular functions. Then, is the cell-time transmitted to another cells? We want to address this issue in the SCN, since it is the sole organ oscillate eternally. We adopt SCN-slice culture system which we established for monitoring peptide-release (Neuroscience, 1994). We made a SCN slice taken from transgenic mice carrying the luciferase gene driven by the mPer1 promoter (mPer1-luc) (Curr Biol, 2001). In this study, we discovered that the application of NMDA, analogous to light stimuli to the living animals, instantly altered the phase of the core clock oscillation of slice-SCN phase-dependently. In collaborating with Professor Masaki Kobayashi, a specialist enabling the visualization of very weak biophoton, we succeed to observe the rhythmic transcription of genes at the single cell level by a cryogenic high resolution CCD camera (Science, 2003). The SCN cells showed robust transcription rhythms with a period length of -24 hours, with several hundreds of cells expressing mPer1 genes synchronously. Moreover, the individual oscillatory cells are arranged topographically: the phase-leader with a shorter period length is located in the dorsomedial periventricular part of the SCN. A protein synthesis inhibitor (cycloheximide) sets all the cell clocks to the same phase and, following withdrawal, intrinsic interactions among cell clocks re-establish the stable program of gene expression across the assemblage. Tetrodotoxin, which blocks action potentials, not only desynchronizes the cell population, but also suppresses the level of clock gene expression, demonstrating that neuronal network properties dependent on action potentials play a dominant role in both establishing cellular synchrony and maintaining spontaneous oscillations across the SCN. Thus, the cell-rhythm oscillation generated by the core clock oscillatory loop is coupled and amplified by the ordered cell-cell communications in the SCN. Tominaga K, Inouye SI, Okamura H: Organotypic slice culture of the rat suprachiasmatic nucleus: sustenance of cellular architecture and circadian rhythm. Neuroscience 59, 1025-1042, 1994. Asai M, Yamaguchi S, Isejima H, Jounouchi M, Moriya T, Shibata S, Kobayashi M, Okamura H: Visualization of mPer1 transcription in vitro by luciferase mediated bioluminescence: NMDA induces a rapid phase-shift of mPer1 gene in cultured SCN. Current Biology 11, 1524-1527, 2001. Yamaguchi S, Isejima H, Matsuo T, Ohkura R, Yagita K, Kobayashi K, Okamura H: Synchronization of cellular clocks in the suprachiasmatic nucleus. Science 302, 255-259, 2003. Fig. 7 Temporal changes in bioluminescence signals from 100 SCN cells randomly chosen in wild-type (upper figure) and mPer1-luc-bearing mCry1/mCry2 double-knockout mice (lower figure). Note variety pattern of peaks in cells of wild type animals, but total absence of rhythmic cells in Cry double knockout mice. By what route SCN regulates the peripheral clocks? Melatonin regulates the sympathetic nervous system by directly acting to the SCN (J. Physiol., 2003). More importantly, sympathetic nervous system plays the key role. In collaborating with Professor Shigenobu Shibata, we demonstrated that hepatic gene expression of clock genes was regulated by the sympathetic nerves (PNAS, 2003). Moreover, we demonstrated that SCN regulates the circadian expression of adrenal corticosterone by the activation of various genes by the route of innervating sympathetic adrenal nerve (Cell Metabolism, 2005). Yes, sympathetic nerve conveys the time of central clock to peripheral organs, and the adrenal gland is the key organ transforming circadian signals from nerve signals to the endocrine signals. Released corticosterone may tune the phase of peripheral clocks. Terazono H, Mutoh T, Yamaguchi S, Kobayashi M, Akiyama M, Udo R, Ohdo S, Okamura H, Shibata S: Adrenergic regulation of clock gene expression in the mouse liver. Proc. Natl. Acad Sci. USA 100, 6795-6800, 2003. Ishida A, Mutoh T, Ueyama T, Bando H, Masubuchi S, Nakahara D, Tsujimoto G, Okamura H: Light activates the adrenal gland: Timing of gene expression and glucocorticoid release. Cell Metabolism, 2, 297-307, 2005. Fig. 8 (Upper figures) Light exposure induces the high level of expression of luciferase luminescence in the adrenal gland (arrows) in mPer1-luc mice. (Lower figure) The schematic representation of the neuronal routes how light resets adrenal or pineal hormones. IML, intermediolateral cell collumn, PVN, paraventricular nucleus of the hypothalamus, SCG, superior cervical ganglion, SPvZ, subparaventricular zone. Monitoring bioactive markers in the brain is fundamental to clarify the circadian time-keeping system in the brain. In collaborating with Professor Daiichiro Nakahara, we first devised a new method to monitor mammalian melatonin in the cerebral ventricle by utilizing the lintracerebral microdialysis probe. It is almost half the century since the hormones such as melatonin and cortisol have the diurnal rhythms. However, the analysis of dirunal secretion of hormonesis hampered by that there are no system to record continuously in a single body. We developed the microdialysis system to analyze the melatonin secretion for several months. By this method, we have revealed for the first time amine-dependent and nerve-independent rhythms. This approach will became more powerful when applied tot the genetically altered mice. Nakahara D, Nakamura M, Iigo M, Okamura H: Bimodal circadian secretion of melatonin from the pineal gland in a living CBA mouse. Proc. Natl. Acad. Sci. USA 100, 9584-9589, 2003. Fig. 9 (Upper figure) Transverse microdialysis probe in the pineal glands. (Lower figures). A double plot of melatonin levels and locomotor acivity for three mice in LD and DD cycles. Note parallel change of melatonin levels of locomotor activity in both LD and DD conditions. Finally we tried to monitor the gene expression of clock gene st real time by inserting the optical fiber directly to the SCN in the brain in freely moving mice. We inserted an optical fiber just above the SCN of mPer1-luc transgenic mice and succeeded to record for several days oscillating luminescence that accurately mirrored native mPer1 mRNA expression. By this method, we first revealed mPer1 gene is activated in the day time, and rest in the night time. These data not only for the first time demonstrate a ticking biological master clock in the brain of a living mammal, they also show that real-time optical imaging of gene expression is a new powerful tool to analyze the higher nervous function of the brain including sleep/wake cycles（Nature, 2001）. Yamaguchi S, Kobayashi M, Mitsui S, Ishida Y, van der Horst GTJ, Suzuki M, Shibata S, Okamura H: View of a mouse clock gene ticking. Nature 409, 684, 2001. Fig. 11 (Upper figure) Location of the input end of the optical fiber in the mouse brain. (Lower figure) Circadian fluctuation of luminescence in the SCN. A mPer1-luc transgenic mouse, previously housed under a 12h light/12h dark cycle, was continuously infused with luciferin (10 µM in artificial cerebrospinal fluid) at a rate of 15 µl/h. Luminescence was recorded under constant dark conditions via an optical fiber positioned above the SCN. One dot represents an average of the values of 5 minutes. Hatched and closed bars at the bottom of the figure represent subjective day and subjective night, respectively. Since Human Genome Project has finished, the revolution of medicine is now going on: now all the history of diseases and behavior of each person from birth to death is referenced to its genome information. However, even this type of correspondence studies develop, there will be no progress how genomic information is reflected to behavioral level. The functional significance of circadian biology exists at this point: the unique feature of circadian biology is that the gene transcription occurs in the SCN reflects the behavioral and physiological rhythms almost in a perfect state. This means that the clock gene oscillation generated by the core loop in each SCN neuron is coupled and amplified at the level of the SCN neuronal nuclei. From here harmonized strongly oscillating activities are spread into the whole brain and to all those peripheral organs, which contain peripheral clocks. As a final result, circadian changes are induced in behavior and hormone secretion. Even though each neuron in the SCN generates circadian oscillation, the system of amplification and transmission needs to be well organized to effectively transmit the time information to the peripheral organs. The real time monitoring of clock gene oscillation at gene, cell, tissue, brain, and system levels will answer the question of how the time signal is born and integrated to the upper layers of life. Investigations of biological clocks open the fascinating perspective to analyze the integrational mechanism of TIME in a vertical arrangement, providing a bridge between single genes and the living organism as a whole. In May 2007, we moved from Kobe University to Kyoto University. The new laboratory is Department of Systems Biology in the faculty of Pharmaceutical Science. Here, we want to reset our work to clarify “How time is generated and tuned”. We hunt this esoteric secret poco a poco by believing a fortune to Ride the Rhythm. Fig. 12 Integration mechanism of rhythm. “Gene” depicts rhythmic transcription of mPer1 and mPer2. “Cell” represents neuronal electrical activities of single SCN neurons. “SCN” indicates the local neuronal and glial circuits. “System” symbolizes behavior and hormonal secretion.